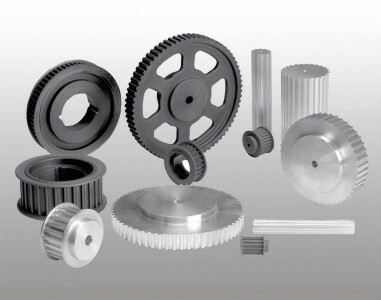 Timing belts are the ideal stock solution for economical synchronous drives. (High Torque Drive) are the development of timing belts with “curvilinear” tooth form resulting a uniform transmission of power and an improved transfer of belt tension to the tension cord. Timing belt pulleys are available flanged or plain with either a pilot or taper bore designed for use with taper lock bushes.